Boston – August 23, 2018 – Rally™ Recruitment Marketing is hitting the road this Fall 2018 with a new workshop to teach content marketing strategies and skills to Talent Acquisition and Human Resources professionals so they can learn to attract talent like a marketer. With 9,000 practitioners, Rally is the largest online community for learning and sharing modern Recruitment Marketing. 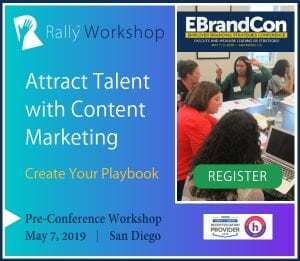 Through educational content and events, Rally brings HR, Recruiting and Marketing professionals together to gain new skills, advance their careers and deliver greater business impact. The workshop is sponsored by Stories Incorporated, TextRecruit, The Muse, ViziRecruiter and Workable. “Create Your Recruitment Marketing Content Playbook” is a one-day, hands-on workshop where attendees will learn how inbound marketing can help them overcome one of the biggest challenges in recruiting: how to proactively attract top talent, rather than always needing to source candidates for every job. Workshop attendees will discover how to create compelling content for their careers website, social media channels, digital marketing campaigns and talent pipelines that will make them stand out from other employers and elevate their recruiting strategy. How to plan out their content calendar for the next month so they can hit the ground running. 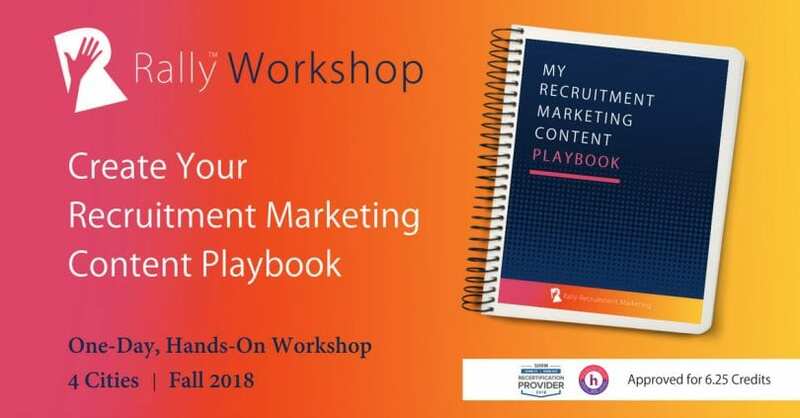 Each attendee will work in-class with instructors to create their own Recruitment Marketing Content Playbook using best-practice templates. All workshops begin at 9 AM and conclude at 5:15 PM, and include breakfast, lunch and snacks, plus offer a great environment for networking with peers. The workshop is approved for 6.25 professional development credits (PDCs) towards recertification from the Society for Human Resource Management (SHRM) and the HR Certification Institute (HRCI). Lori Sylvia is the Founder and CEO of Rally Recruitment Marketing. She began her career as an award-winning tech journalist and went on to build industry-leading marketing functions at five start-ups. Before founding Rally, Lori was Chief Marketing Officer of SmashFly Technologies, where she and her team educated the market about modern Recruitment Marketing practices. With Rally, Lori is working across the industry to inspire more people to become Recruitment Marketers to lead the future of talent acquisition. Kaitlyn Holbein is the Content Strategist at Rally Recruitment Marketing, where she curates and creates content on Recruitment Marketing best practices for the Rally community. Kaitlyn is also a Recruitment Marketing consultant and practitioner, helping organizations define their employer value proposition and produce content to attract talent.